I’m always slow to abandon the freedom of under-painting and commit to working on the layers people will consciously look at, but I have to take the plunge eventually. 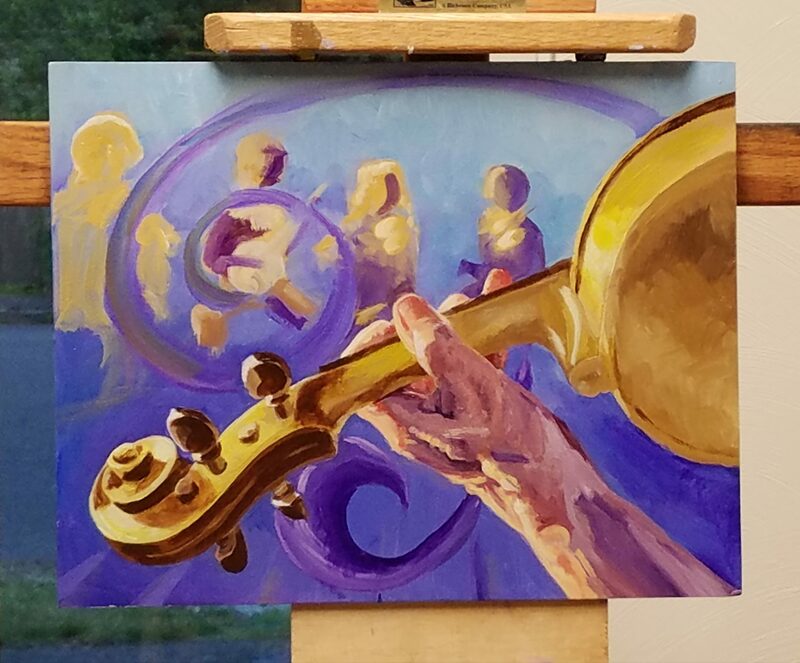 With this painting I had some extra motivation: I was starting a second painting, and before I used the crazy yellow/purple underpainting scheme a second time, I wanted to see if it actually worked. Spoiler: it works! Though since I’m still using fairly thick, opaque paints, the importance of the specific colors in the underpainting is questionable. I painted this about two weeks ago (I’m behind on updating the blog), and I assumed I’d remember my paint choices. Note to self: “I’ll remember that and don’t need to write it down” is a dirty lie you tell yourself, and you should be ashamed. Here, to the best of my recollection, was the palette for the hand. Perylene? Red, which my phone wants to correct to ‘Problems Red’. Burnt Umber? Maybe? Or not. There could’ve been cadmium yellow. Its anyone’s guess. Hopefully some kind of deep memory will kick in when I go to fix up the arm and I’ll magically grab the right paints out of the drawer. And perhaps I’ll win the lottery, while I’m practicing my magical thinking. I already cleaned the palette, so I can’t even try to reconstruct it from the mess. This is a lesson for me — I’ll jot down my paint selections next time.